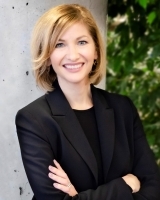 Amy MacLeod is a seasoned tech executive, thought leader and trusted advisor to business and public leaders, with 25 years experience in political and private sectors where she has served as the senior communications executive and spokesperson for multiple organizations. A member of the Mitel leadership team, in 2018 Amy was appointed to her current position as the company’s first Corporate Diversity Officer. Prior to joining Mitel, Amy held senior communications roles at General Dynamics Canada, Alcatel-Lucent, and Newbridge Networks. She started her career in politics as a senior staffer for a Member of Parliament. Amy currently serves as Chair of the Board of Directors of the Kanata North Business Association, Canada’s largest technology park. Amy earned a B.A. in Political Science from the University of Waterloo.